ENTRIES To view the entry list in full.Click HERE!!! 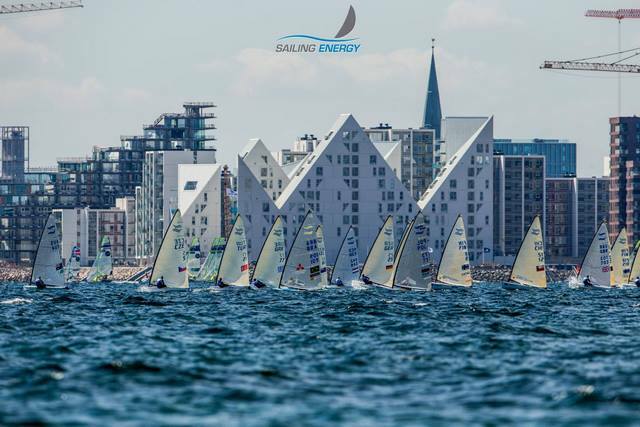 The amount at stake for many of the sailors at the Hempel Sailing World Championships Aarhus 2018 will gradually be squeezed out each day and Friday brought into relief the pressures in the Finn fleet. 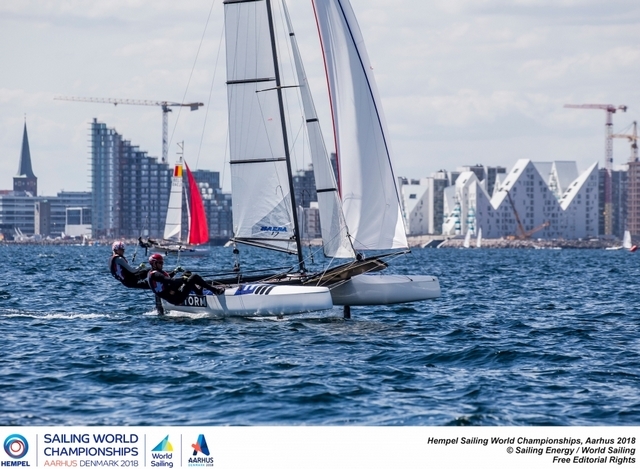 Two flying Dutchman – in separate Finn qualification fleets - had good days in stronger, more consistent days in Denmark’s beautiful Bay of Aarhus, and the subtext is their Olympic ambition. great jubilation by the man in pole position, Nicholas Heiner, 29. After a 14th place in tricky winds on Thursday, Postma was imperious in his first race, leading off the line and managing the field consummately until the end. He followed that with two third places to lead the overall standings. Heiner is in sixth after a seventh, fifth and third place, but his sixth place on Thursday means he probably still has a discard up his sleeve. Each country has different selection criteria, the Netherland’s is quite rigid in the fleets where there is competition. 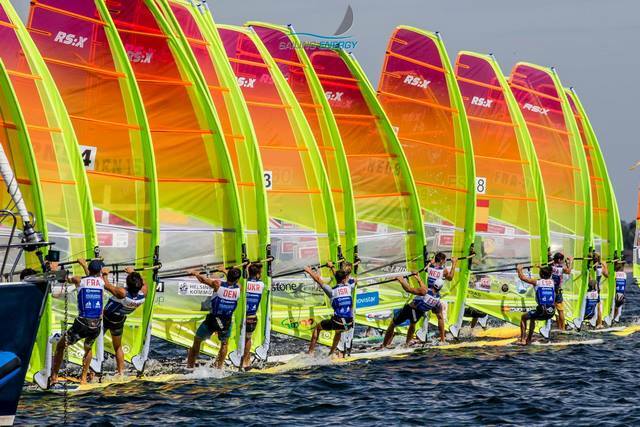 If two of their sailors finish in the top 8 then the selection is deferred until next year. 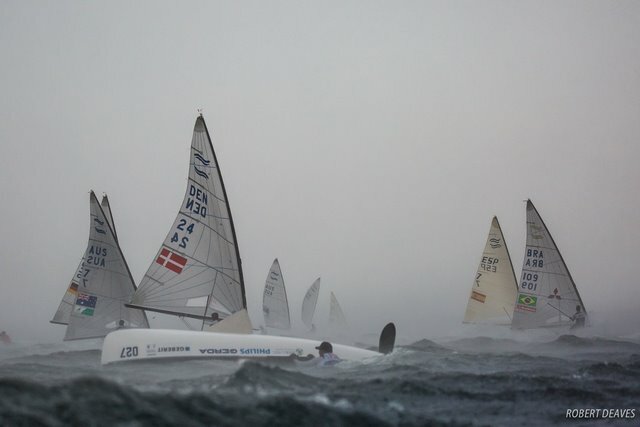 Sailing is often described as chess on water, but sometimes its chess off the water too. The timing of Postma’s comeback is essentially a defensive move to ensure selection remains open. 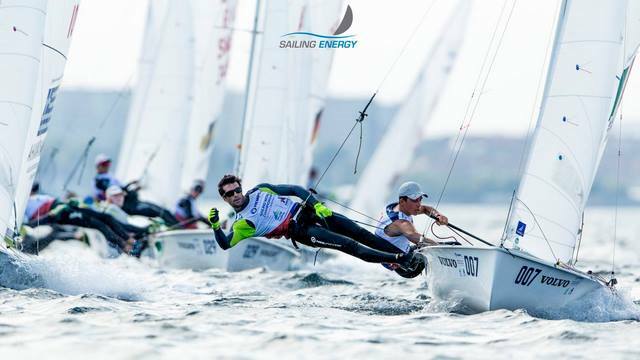 For Heiner, the 2014 World Championships are still strong in the memory – he was the Laser world champion in Santander but did not get the selection for the 2016 Rio Olympics. Friday was played out under a bright sunshine and the absence of clouds aided the earlier arrival of the south to south-easterly sea breeze that built from 8 to 12 knots with gusts of 16. 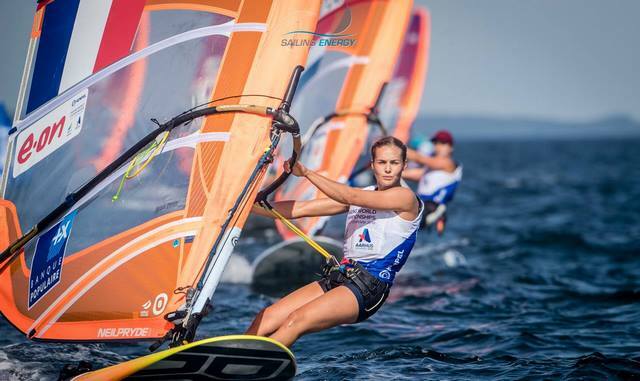 The huge Laser and Laser Radial fleets got underway and it was no surprise to see the Dutch Rio Olympic champion and three-time world champion Marit Bouwmeester near the top of the leaderboard. Although, even Bouwmeester did not have it own way, with her young compatriot, Maxime Jonker, winning the first race ahead of her. It underlined the strength in depth of the Netherlands programme. The 165 Laser boats were split into three fleets. New Zealand Rio 2016 Olympic bronze medallist Sam Meech was peerless in his, winning both races. But there were few surprises and all the main contenders are lying in the top 10. In the women’s 470, Hannah Mills, the Olympic champion in Rio and new crew Eilidh McIntyre - who know a thing or too about pressure from national team mates - put a difficult Thursday behind them by winning both their races. 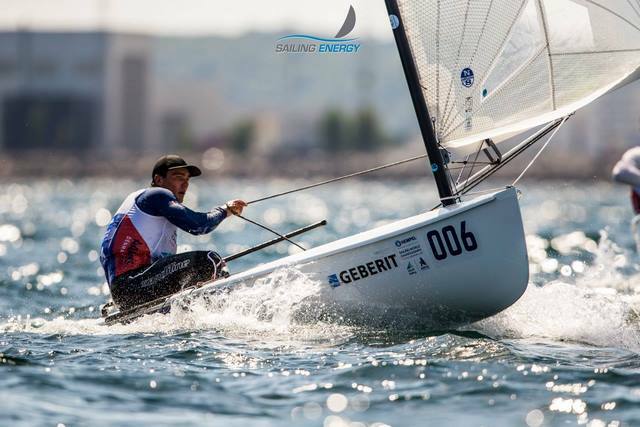 The men’s 470 ran three races to catch up from Thursday and Swedish 2018 European Champions, Anton Dahlberg and Frederik Bergström were solid but bettered by Japan’s Kazuto Doi and Naoya Kimura. The surprise of the day was perhaps the struggle of Australia’s Mat Belcher and William Ryan, the silver medallists in Rio and Belcher being the gold medallist in London 2012. The forecast is good again for tomorrow. By the end of Saturday all the classes should have Championship races under their belts. Only the Finn and the 470s (men and women), will not be on the water. 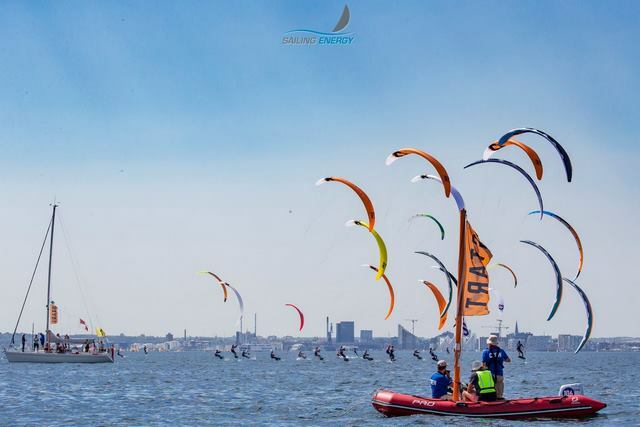 "Today we had really nice conditions on the water, a sunny and warm normal sea breeze up to 11 knots. My strategy was to try and keep it simple, try to get good starts without thinking that this regatta is the most important of the year. "I tried to stay concentrated and everything else came along. I feel very proud and rewarded for all the work I have put in to this." "It's a perfect start for me. I couldn't really ask for much more from a first day but it's still really early in the regatta and I'm going to have to take it day by day, but looking forward to the rest of the week. "There were some dangerous moments but I managed to make a couple of good decisions which led to two good races and my speed was reasonably good as well." "I got off to a nice start with two very solid results. I'm happy with my speed and how I feel in the boat, which is great. 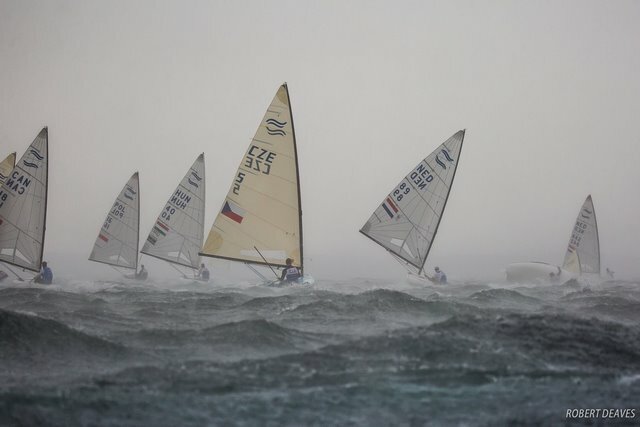 I didn't make a huge mistake in the final race, but the wind shift lasted longer than every other beat we had sailed and I found myself out of position at the top mark. "It's a long week ahead of us but if I can keep putting days like today together I am confident I will be in the mix by the end. 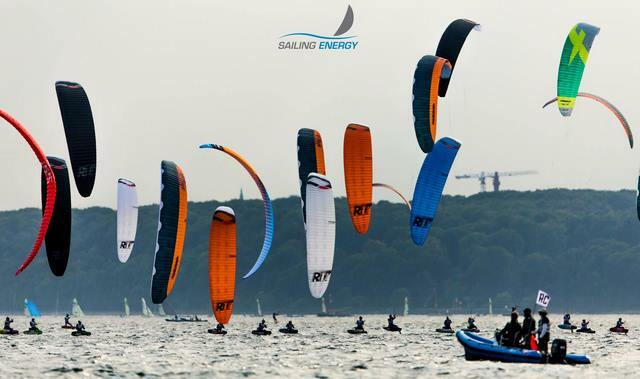 The conditions were fantastic and I am grateful that we got onshore racing on stadium course." "Today was an awesome day, we managed to rectify the errors that let us down in yesterday's races and come away with two bullets. This venue gives nothing away though and it's going to be a long hard week." "The conditions started off light, but the wind developed. Not much waiting around and we secured two good races - fourth in the first race and third in the second. We had 10 knots during the second race. "I'm feeling confident. The conditions are very similar (to his home spot in Kiel). Similar wind patterns but Aarhus is much warmer and choppy. The conditions were different today, so I couldn't get an advantage unfortunately. 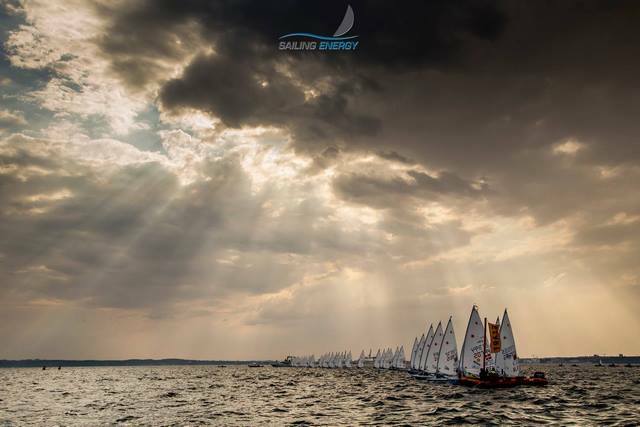 Its traditional of the Laser class to have the largest fleet, imagine 60 boats at a start line. It will get interesting when the gold and silver fleets arranged." “They are staying here with me because it’s summer and they have a break from school,” she said. “I’m really happy and more relaxed when family is with me in competition and they support me. They are my fans and they always believe I can be the best. Some of the usual suspects dominated day one of the men’s RS:X with France’s Louis Giard continuing his dominant 2018 form to top the leaderboard. But two more familiar Flying Dutchmen are breathing down his neck. Kiran Badloe won his last race to take the yellow bib from his friend and the king he would depose – double Olympic champion, Dorian van Rijsselberghe. The surprise was Italy’s Daniele Benedetti in second after just two months training following eight months out with a knee injury. And China’s class world champion, Bing Ye, was lying 73rd overall after finishing 34th, 34th and 33rd. A Chinese men’s team that had been so dominant in Enoshima, Japan was dispersed on the winds. A momentous World Championship debut saw France’s Nicolas Parlier underlined exactly why he is the red-hot favourite by winning all six of his races. His compatriot, Theo de Ramecourt was almost as dominant in the second fleet. 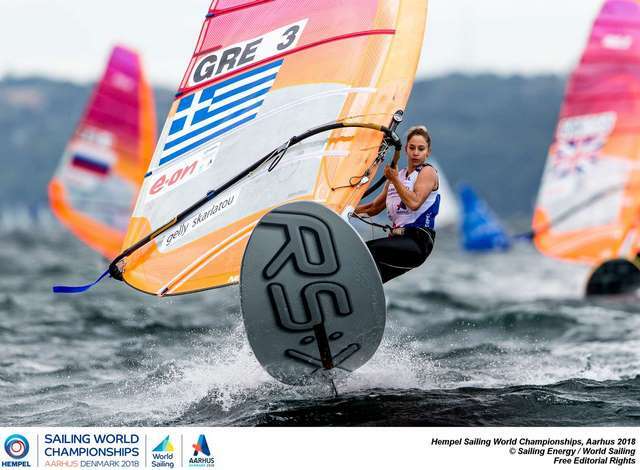 Likewise, USA’s Daniel Moroz showed why she is the red-hot favourite in the women’s kite by winning the last two of her three races. She will have been furious to finish second in her first one. 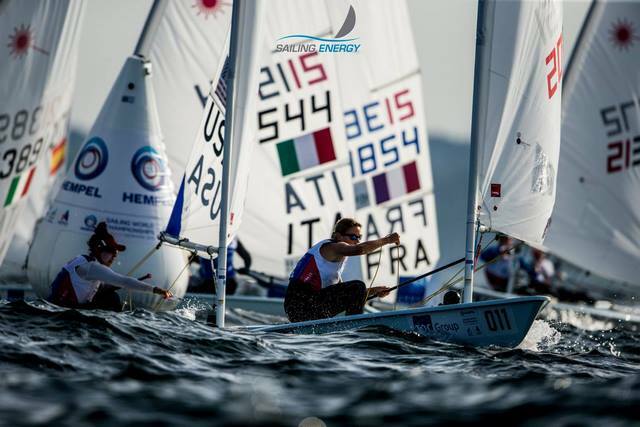 Italy’s Ruggero Tita and Caterina Marianna Banti underlined the pre-boat park consensus that “there are the Italians and everybody else” by winning all three of their races in choppy conditions that were too hot for handle for many in the fleet. Yesterday, it was one New Zealand crew ahead of two French ones, it is now the reverse. Two third places took France’s Lucas Rual and Emile Amorol top of the leaderboard, ahead of the two New Zealand crews in this huge 86-boat class with three fleets. 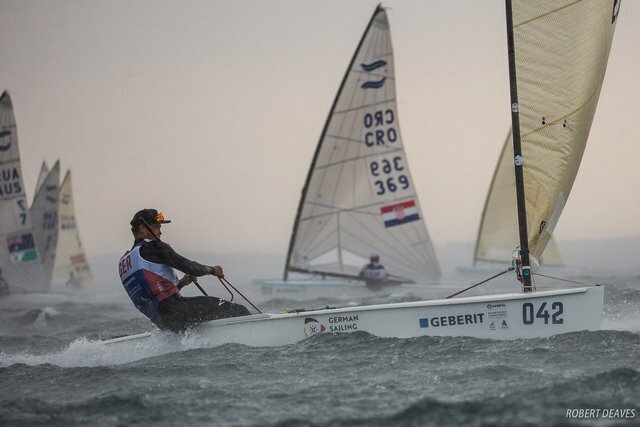 But two powerful crews have moved ominously onto their shoulders, Croatia’s Sime Fantela (Rio 2016 Olympic champion in the 470) and his brother, Mihovil Fantela, and Australia’s William Phillips and Iain “Goobs” Jensen (Olympic gold medallist in 2012 and silver medallist in 2016 with Nathan Outteridge) who is standing in for Phillips’s injured brother Sam. 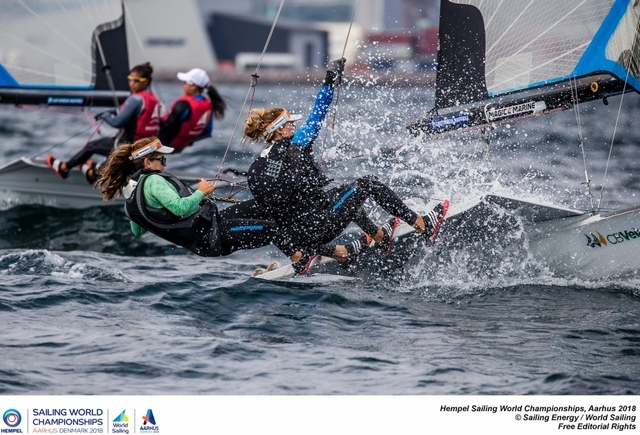 Local favourites Ida Marie Baad Nielsen and Marie Thusgaard Olsen, who have grown up racing in the Bay of Aarhus and cheered the return of the westerlies as other quivered, moved to the top of the leaderboard with a solid third and fourth. 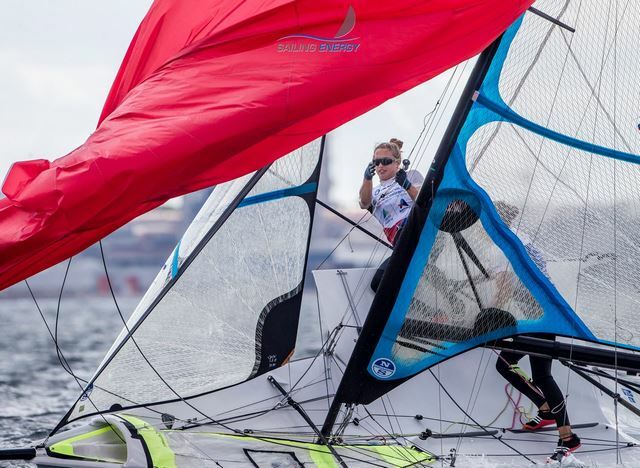 Great Britain’s Charlotte Dobson and Saskia Tidey had a second place and a win to move into second overall with the Olympic and Volvo legends all hovering on their shoulders. Two second places from Anne-Marie Rindom saw Denmark claim another top spot. The surprise is that Netherland’s Olympic champion, Marit Bouwmeester is still back in ninth after a 16th place in her first race of the day. 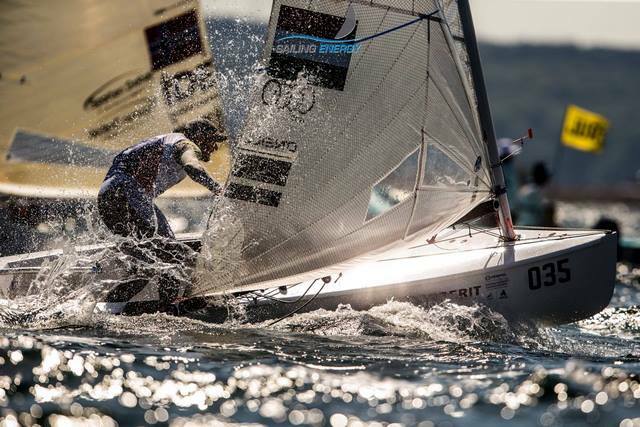 Finn, Men’s 470s, Women’s 470 were on a lay-day and will recommence in gold and silver fleets tomorrow. As you can see, only Paige Railey maintains a podium position, and wonder kid Daniela Moroz, the shoe in for 1st in womens kiteboard collected 5 DNC's today, we have a message out to find out why. 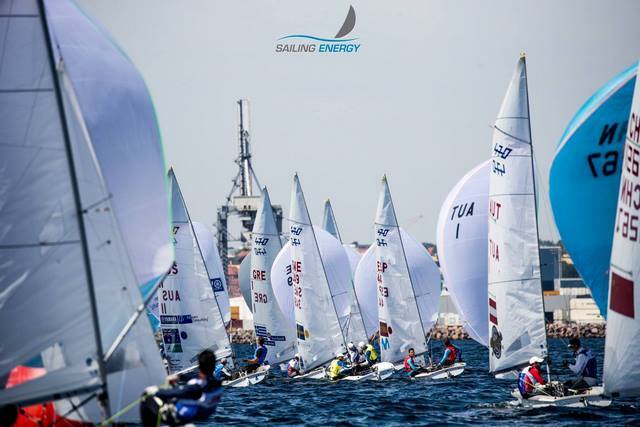 Stuart McNay and David Hughes are currently 9th in Finn and Charlie Buckingham is currently 11th in Laser. Other than that, not much to brag about. 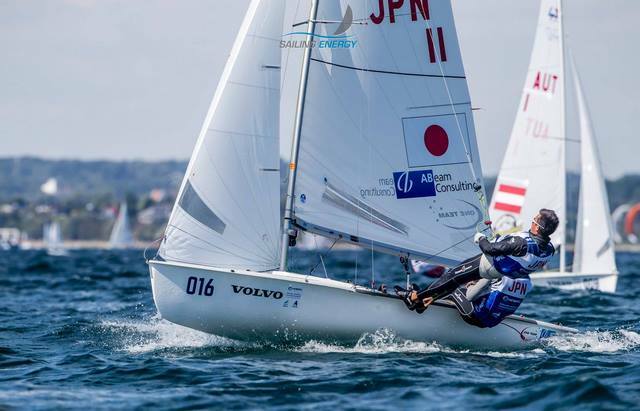 The Hempel Sailing World Championships Aarhus 2018 has its first medal race fleet in the women’s 470 with Japan’s duo of Ai Kondo Yoshida and Miho Yoshioka leading by five points. Yoshida and Yoshioka, fifth in the Rio 2016 Olympics, were sixth in the only race possible on Tuesday. France’s Camille Lecointre and Aloise Retornaz, bronze medallists in Rio, won to close in second place. But Hannah Mills, the Rio Olympic champion and her new crew, Eilidh McIntyre, were furious after finishing 18th – their worst of the series. For Mills, however, “today was absolutely ridiculous. The wind came in at 5-7 knots and was pretty steady, probably the steadiest we’ve had in Aarhus. 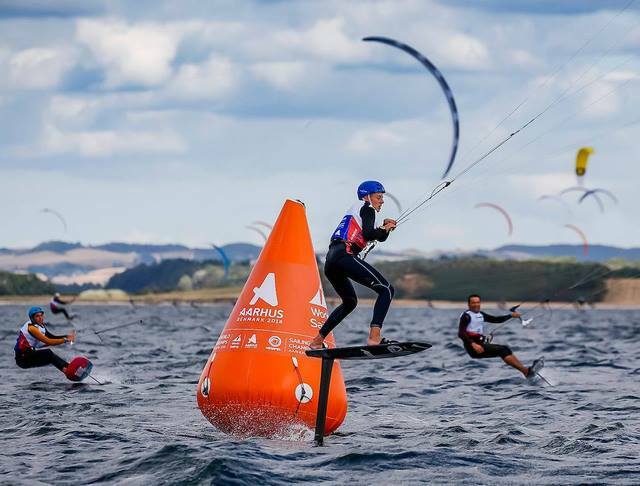 The World Championships in Denmark is coming to the business end of the week and the fields are beginning to narrow toward the medal race. 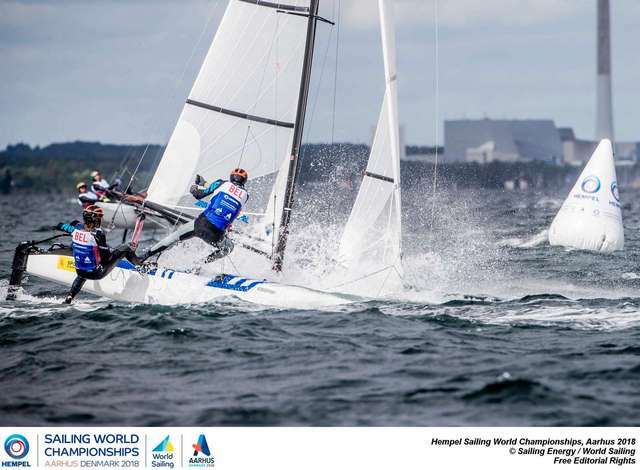 Four more fleets, the Finn, the men’s and women’s 470s, Laser and Laser Radial medal race fleets could be decided tomorrow – wind permitting. After Big Monday stalled, Tense Tuesday at least saw plenty of racing and left some big names with bigger scores. Some fleets were on the water for six hours, starting, stopping and pressing in shifting pressure in the Bay of Aarhus. 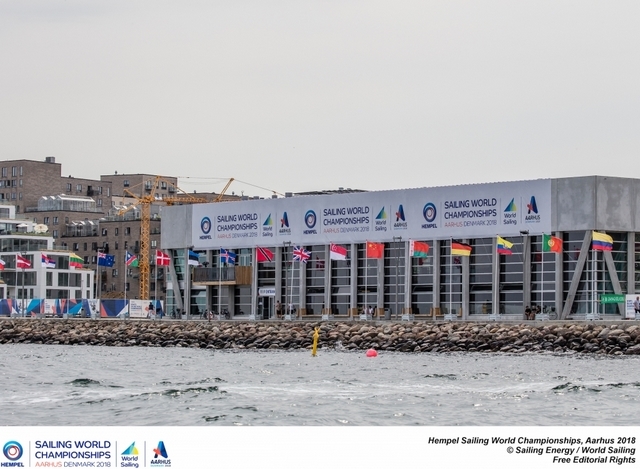 But the top tens are still full of familiar names and after nine races in all conditions in the men’s 470, the Swedish 2018 European Champions, Anton Dahlberg and Frederik Bergström held their lead over the French and extended against Australia’s Mat Belcher and William Ryan, the silver medallists at the Rio 2016 Olympics. 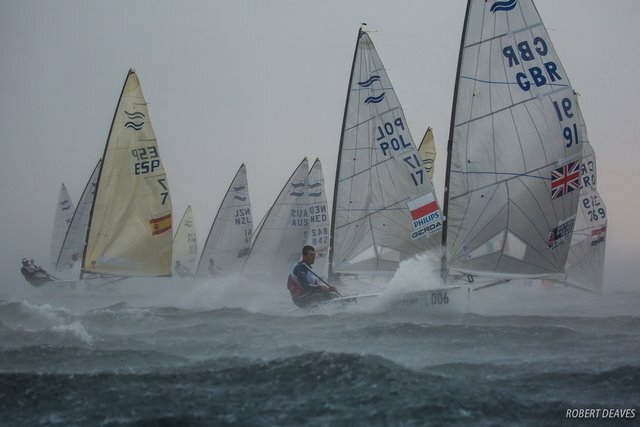 They will try to complete one more race tomorrow on the reserve day before the medal race on Thursday. 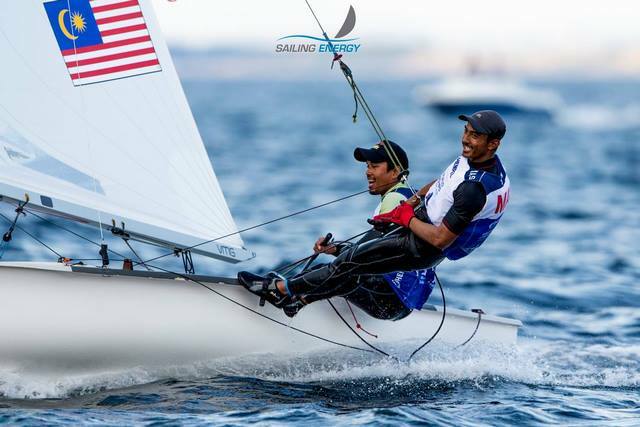 Belcher, 35, won gold at the London 2012 Olympics, and with Simon Fantela, the 2016 Olympic champion having switched the 49er, his boat, as has been the case for almost a decade, is the one to beat. The Swedes have emerged from the pack this year and look capable of taking the crown. 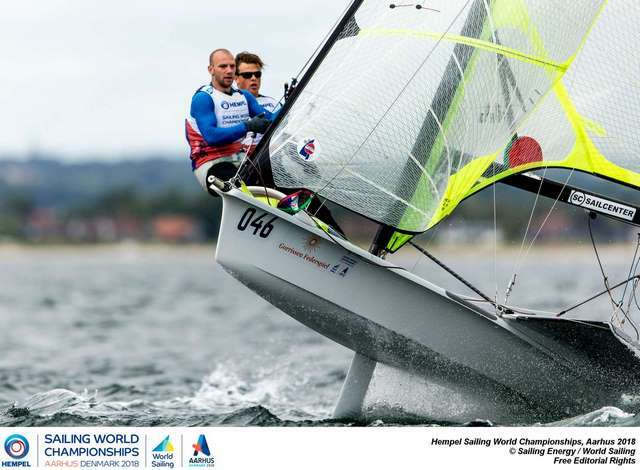 But they have never won a world championship and missed out in the class worlds a year ago after leading Belcher and Ryan by a point going into the medal race. Do they think it is easier to become a champion or stay one? Like Mills he is feeling the heat from the challengers. But despite two finishes outside the top there was the ever-present glint of man who’s been there and done that in eye of Belcher in the boat part afterwards. The man who won the 2011 World Championships in Perth and 2014 World Championships in Santander fired a perhaps mischievous shot across Swedish bows. He acknowledged the rise of the Swedes but hinted in his own inimitably friendly way that the gloves were coming off. 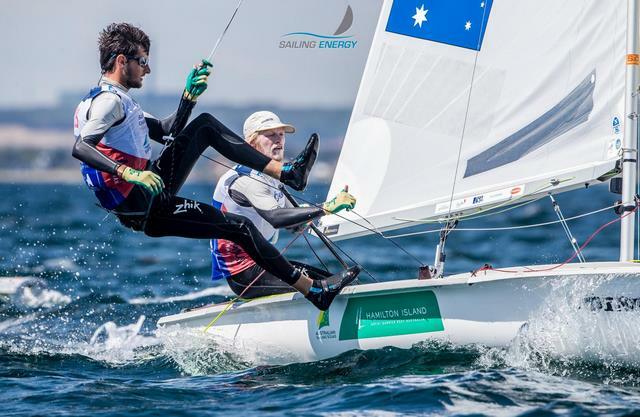 The laser has been even more keenly fought and Australia’s Matthew Wearn continues to look like the greatest rival of his compatriot, Tom Burton, the 2016 Rio Olympic champion. 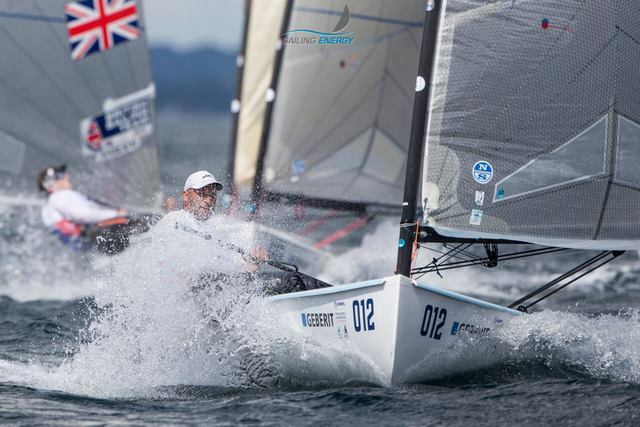 After eight races, Wearn, 22, who became European champion this year, leads after two single digit races on a day when many of the top ten registered at least one huge double digit. Burton, 28, is eight points back in fourth. Wearn won the Test Event in the Bay of Aarhus last year against Burton, but this World Championships would be his biggest step towards a changing of the guard. The gold fleet only managed one race and the second was abandoned. Danish, Anne-Marie Rindom continues her lead at the top of the leaderboard. Paige Railey (USA) is second, and Sarah Douglas (CAN) is third. 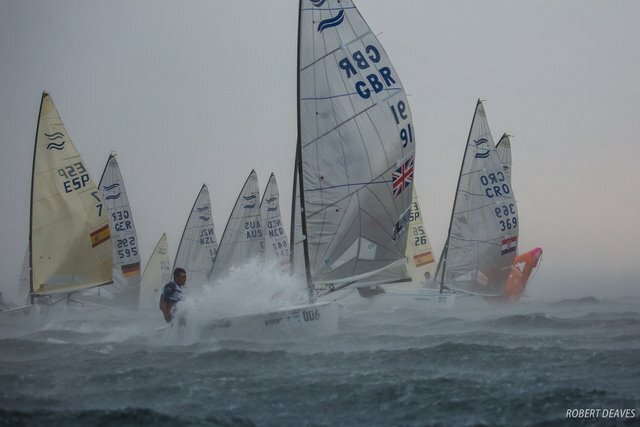 Edward Wright (GBR) had a good second race today, finishing second and he holds first place overall. Tom Ramshaw (CAN) in second, and Josh Junior (NZL) follow closely with only one point separating him and Ramshaw. 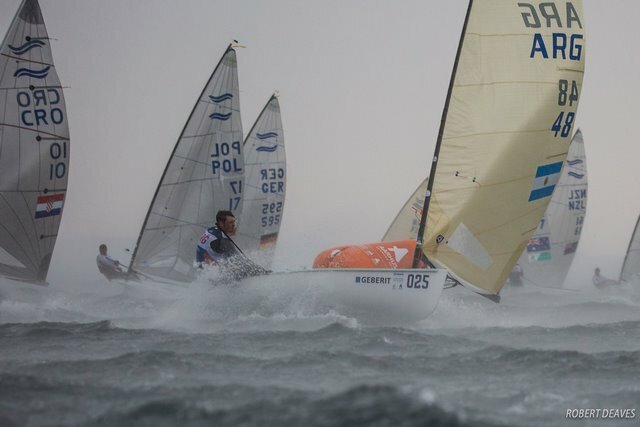 The RS:X Men completed three races today with Pawel Tarnowski (POL) topping the leaderboard, and Dorian Van Rijsselberghe (NED) in second place. Italian, Daniele Benedetti is third. In the RS:X Women, Yunxiu Lu (CHN) leads overall after day six. Lilian De Geus (NED) is second and Charline Picon (FRA) is third. 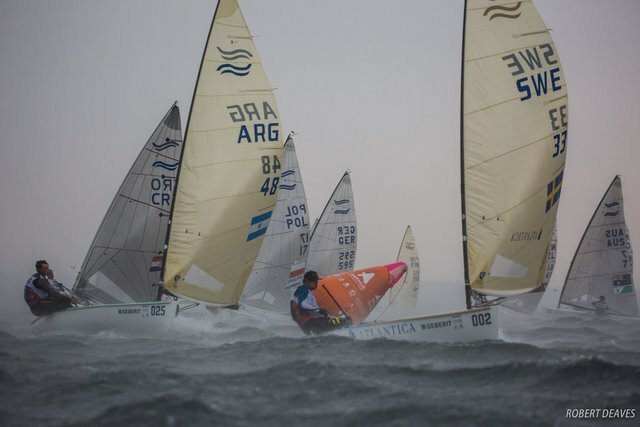 Santiago Lange and Cecilia Carranza Saroli ARG), take charge after a tough couple of races in the Nacra 17 fleet. Brazilian’s, Albrecht & Nicolino de Sá shoot up to second and Jason Waterhouse and Lisa Darmanin move up to third. 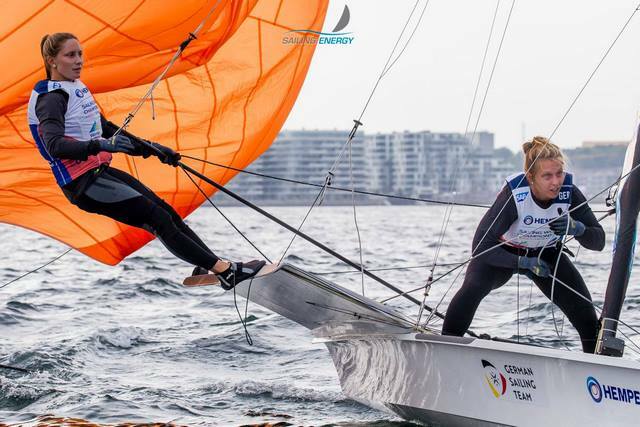 Ida Marie Baad Nielsen and Marie Thusgaard Olsen (DEN) hold first place, and the Dutch, Annemiek Bekkering and Annette Duetz take second overnight. Austrian’s Tanja Frank and Lorena Abicht finish the day in third. 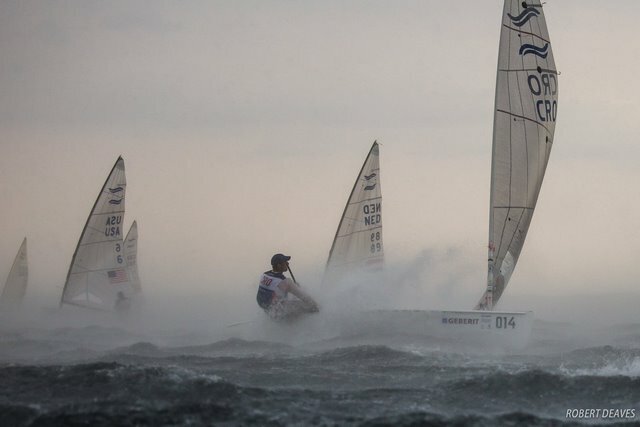 There was no racing today for the 49er Men as today was their layday. 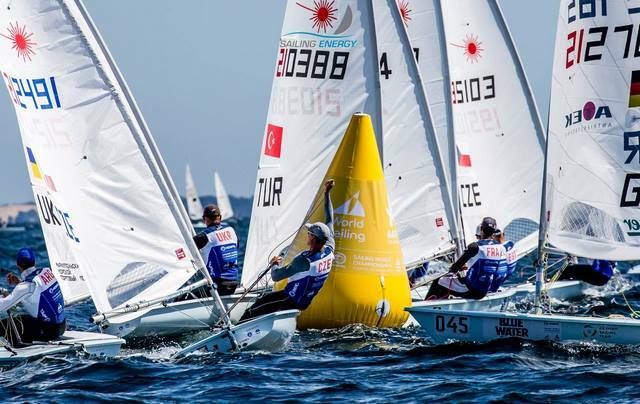 he Men’s Heavyweight Dinghy – Finn and Men’s Two Person Dinghy – 470 have concluded fleet racing at the Hempel Sailing World Championships in Aarhus, Denmark handing more nations a spot at the Tokyo 2020 Olympic Sailing Competition. Japanese sailors were represented in both fleets but as host nation, receive an entry into every Tokyo 2020 Olympic sailing event. 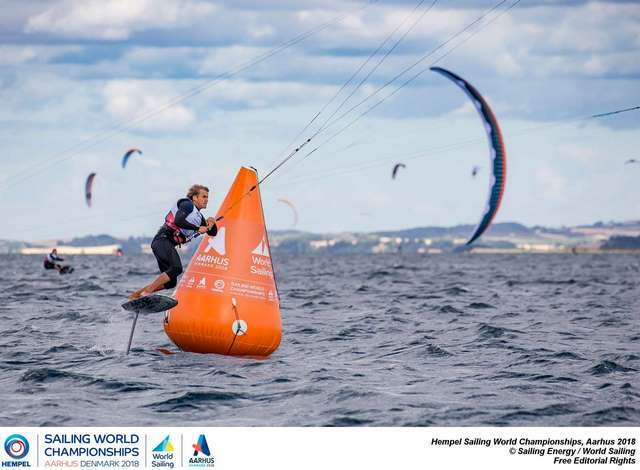 Giant Swede Max Salminen drove home his advantage in the eye of the storm in the Bay of Aarhus on Wednesday to win the last race of the day in the Finn class and establish a potentially decisive eight-point lead for medal race tomorrow. 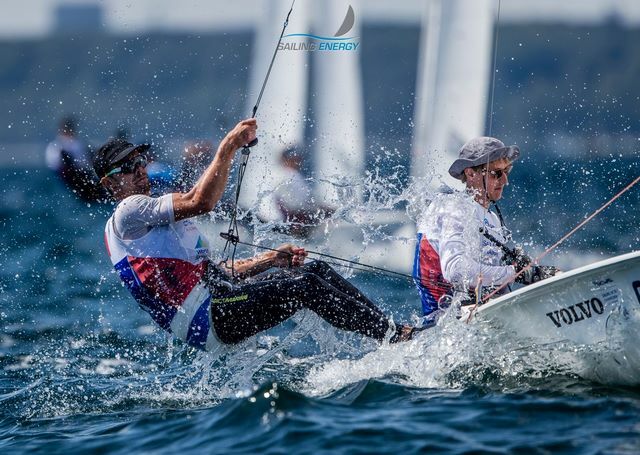 A hot and humid day seven at the Hempel Sailing World Championships Aarhus 2018 saw us coming to the business end and some of the big names are rising to the occasion, but there are some notable absences from the top 10 qualifying for the medal race. 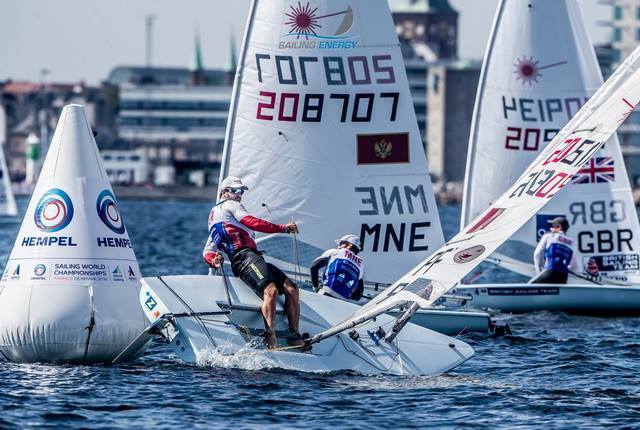 The 29-year-old Salminen, who won gold in the Star class at the London 2012 Olympics, was sixth after moving to the Finn in at the Rio 2016 Olympics and won his first class world championships in the Finn last year. He will have enjoyed the final downwind in the lashing rain – arriving 20 minutes ahead of the forecast - as the wind jumped from single digits to 23 knots, gusting 30. But the top six are all in with a realistic chance of winning in the winner-takes-all medal race, where points count double. Four points separate Hungary’s Zsombor Berecz, New Zealand’s Josh Junior, Canada’s Tom Ramshaw and the Dutch rivals Nicholas Heiner and Pieter-Jan Postma (fourth and sixth respectively). There will, however, be no Jorge Zarif, the Brazilian, who just missed out on a medal in Rio and has been the dominant force in the Finn this year. He has had a disastrous last two days. America’s Caleb Paine, the bronze medallist in Rio, had looked well set after sixth in the first race of the day, but a 33rd place in the last race left him 12th. The same fate nearly befell Great Britain’s Ed Wright. 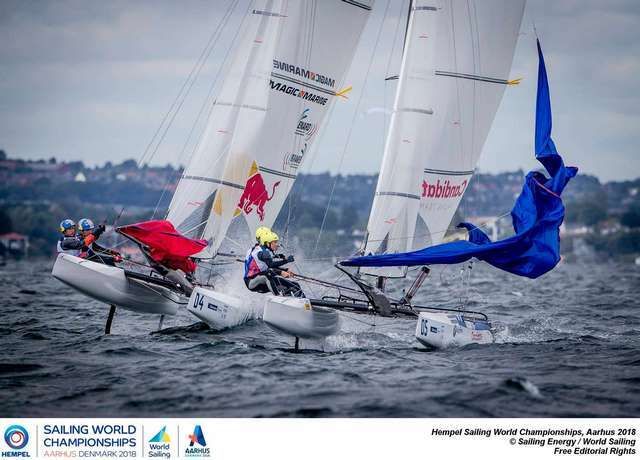 At the start of the day, Wright, had a seven-point lead on three sailors close behind. 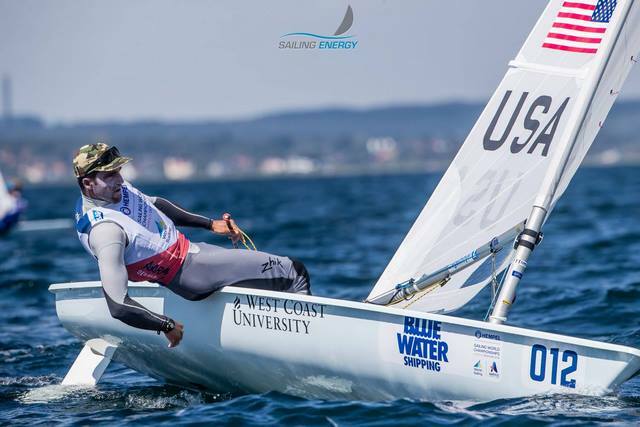 With the potential for no races in the light airs that kept them on shore for most of the day, he was looking at a healthy lead going into the medal race tomorrow. A 27th and 19th place put paid to that and almost saw him miss out completely. Denmark has no one in the top 10, but the Finn will be followed very closely by a knowledgeable home crowd in tomorrow’s stadium race. It is the class their Olympic legend, Paul Elvstrøm – who won four Olympic golds – made his and Denmark’s own in the 1950s and 1960. 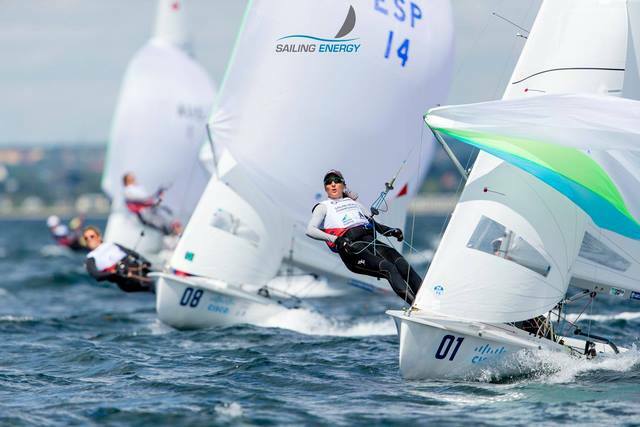 Danish sailors have won the Finn Gold Cup ten times. Great Britain took under that mantle under their own colossus, Ben Ainslie, and then Giles Scott. 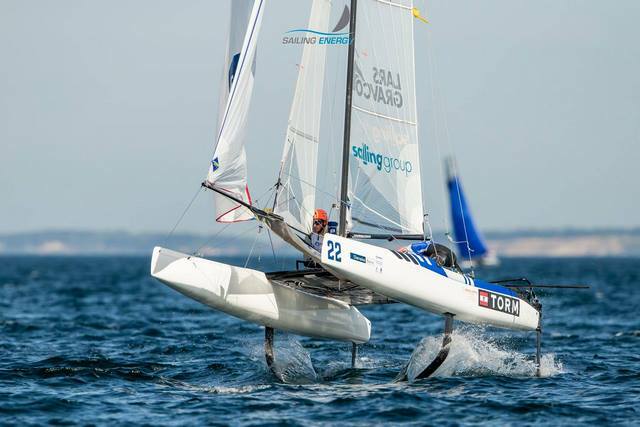 But the absence of the Scott, the Olympic champion and four-time winner of the Finn Gold Cup (the world championships), away on other projects, has seen others rise and Salminen will be seeking to prove that it is his and Sweden’s time. 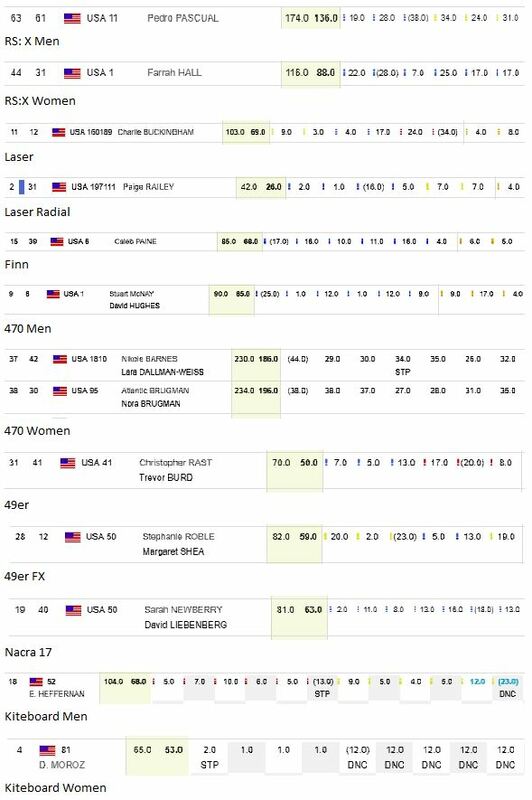 There were fewer surprises in the men’s 470, who completed the final race of their gold medal fleet series today. 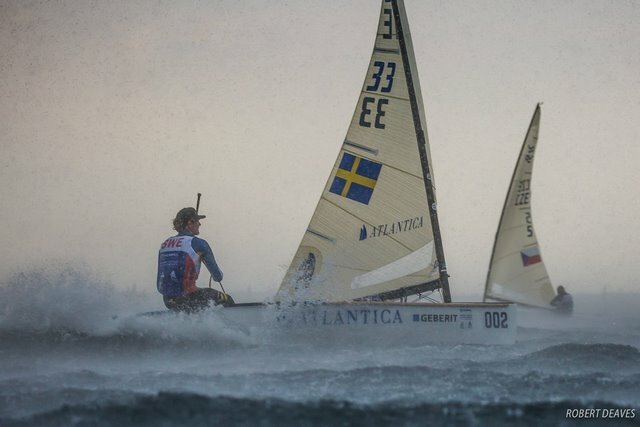 The Swedish 2018 European Champions, Anton Dahlberg and Frederik Bergström, could only manage eighth place and saw their lead cut to six points over two chasing crews. They are in touching distance of their first world championship title but will have their hands full watching Japan’s Tetsuya Isosaki and Akira Takayanagi, who finished second yesterday. 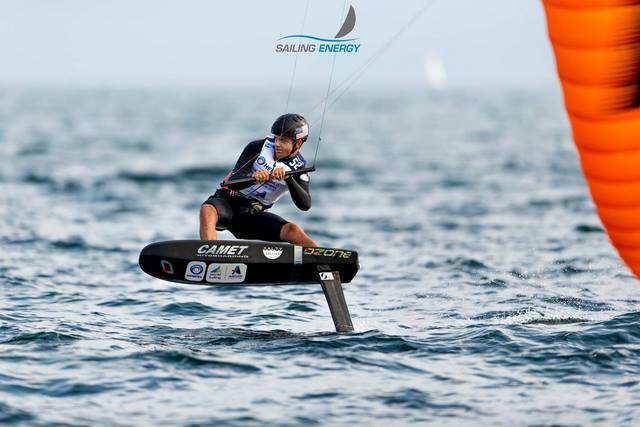 France’s Kevin Peponnet and Jermie Mion are third, but level on points with the Japanese. 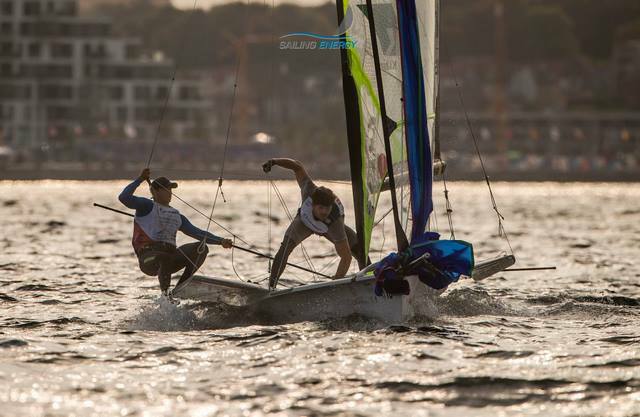 All three will have to be careful that they do not get so wrapped up in their own battles that they let Australia’s Mat Belcher and William Ryan, the silver medallists at the Rio 2016 Olympics, slip past. 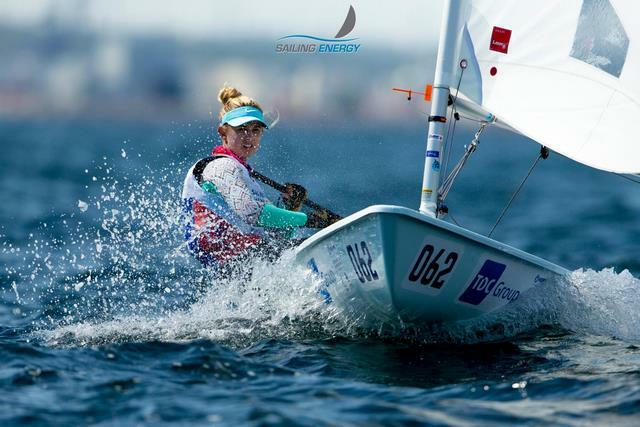 The Australians could only finish tenth and are 13 points behind the leader, but if anyone knows how to win a medal race it is Belcher, who won gold at the London 2012 Olympics, and the 2011 World Championships in Perth and 2014 World Championships in Santander. 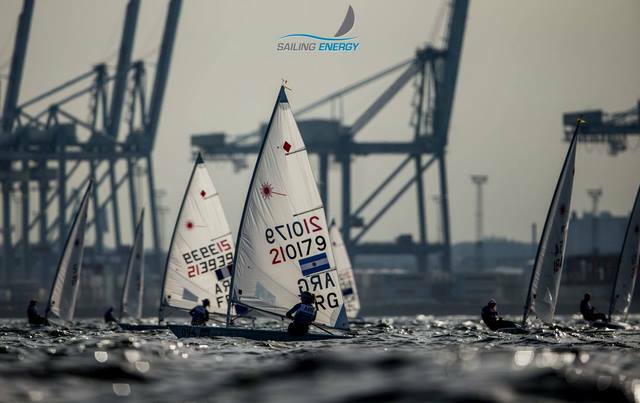 The fleet could only manage one race and will to race once more tomorrow on the reserve day to finish the series ahead of the medal race on Friday. Pavlos Kontides, who became the first-ever Olympic medallist for Cyprus (in any sport) with his silver at the London 2012 Olympics, is leading after finishing second. Australia’s Matthew Wearn is three points behind, able to discard his 15th place today, and his compatriot, the Rio 2016 Olympic champion, Tom Burton is a further two points back. New Zealand’s Rio bronze medallist, Sam Meech, the long-time leader, slipped further back with 13th today and is 13 points off the lead. But the last race tomorrow could still change everything. The fleet could only manage one race and will to race twice more tomorrow on the reserve day to finish the series ahead of the medal race on Friday. In difficult and shifting conditions before racing was abandoned, there were some big double-digit scores at the top of the leaderboard. Just one point separates the top three. 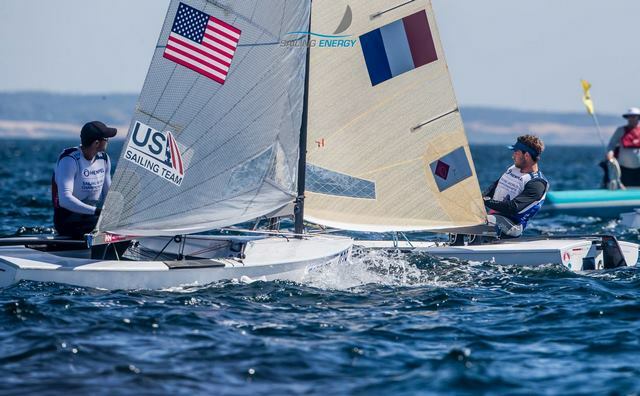 Leader Paige Railey (USA) finished 37th out of the 60 boats and third-placed Anne-Marie Rindom, Denmark’s Rio 2016 bronze medallist, 44th. The flying Dutchwoman, Marit Bouwmeester, lies fifth, 19 points behind the leader. But no one will be writing off the woman who won gold at the Rio 2016 Olympics and the 2011 World Championships in Perth and 2014 World Championships in Santander. 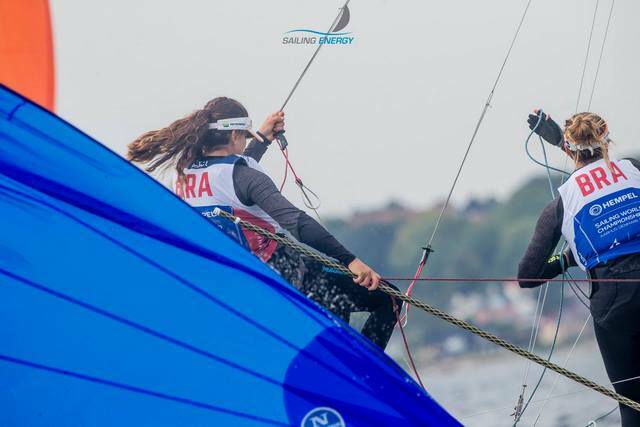 Austria’s Tanja Frank (the Rio 2016 Olympics bronze medallist in the Nacra) and Lorena Abicht were serene in the rapidly shifting winds and fortunes as others in the leading group faltered. They finished top overall after winning the last of the first three races in the gold fleet with three to come tomorrow. 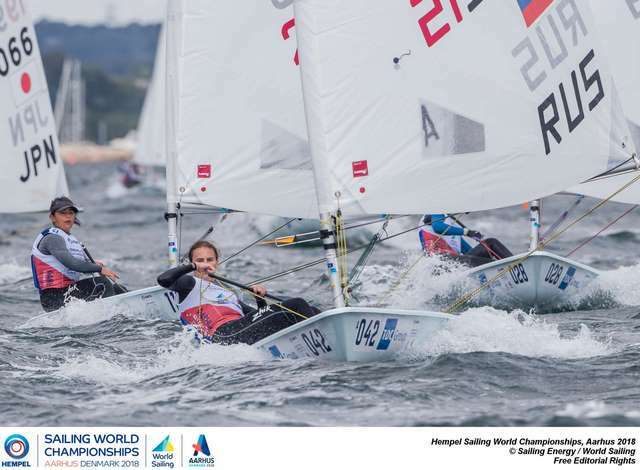 Local favourites, Ida Marie Baad Nielsen and Marie Thusgaard Olsen started the gold medal fleet races today 10 points ahead overall, but a penalty turn on the first upwind left them near the back. They managed to finish 18th in the 30-strong field, but lost the lead it was a sign of things to come as they slipped to fourth overall. The first race was abandoned no racing was possible. They made it in just as the storm front hit the Bay of Aarhus. Slight change in the Women’s leaderboard, Daniela Moroz (USA) now leads, while Elena Kalinina (RUS) sits in second and Alexia Fancelli (FRA) in third. 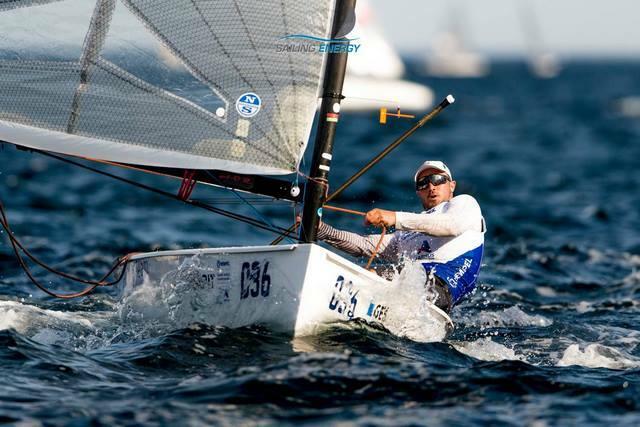 “I’m tired after today, but it’s a huge relief to qualify my nation and go into the medal race as the leader. “I can see the Olympics in my vision. It’s nice to have a chance to defend my World title after a long week. So far, the competition in my fleet has been great and it’s a shame that we’re missing Giles Scott. "[A 13th] would be OK but, unfortunately, the people who I need to be in front of did really well in the race. If I didn’t have a bad race yesterday, I would be more than happy with that. "It’s not quite where I wanted to be. We still have one more race tomorrow so there are a lot of points on the line. 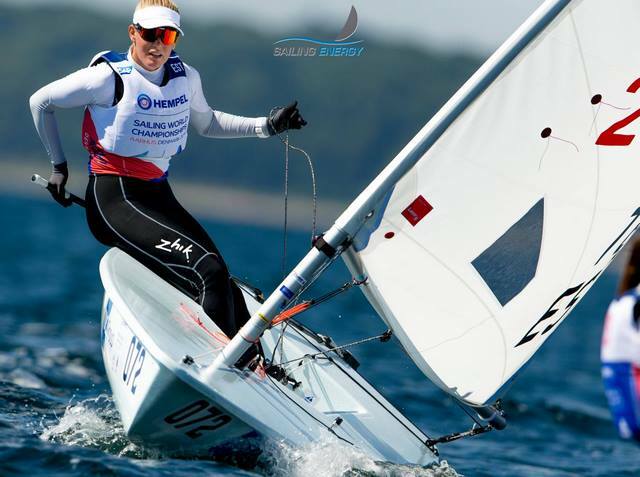 I will try to get myself back into a good position before the medal race." 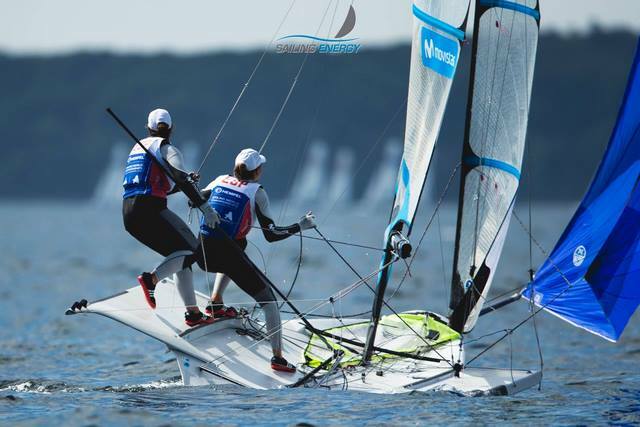 “We were chipping away with all the boats today - it was really tough race course, so we were just trying to make sure that we didn’t have any issues. “We’re happy with the way today has gone. It’s one of our first gold fleet races and we’ve only been in the class for a year now, so we are pushing hard. Everyone around us is so good. What a race! 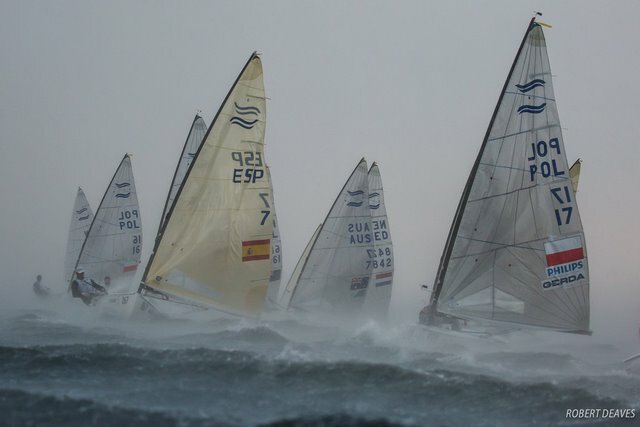 A 35 knot gust in Race 10 of the 2018 Finn Gold Cup tested Finn sailors and Finns to the max. 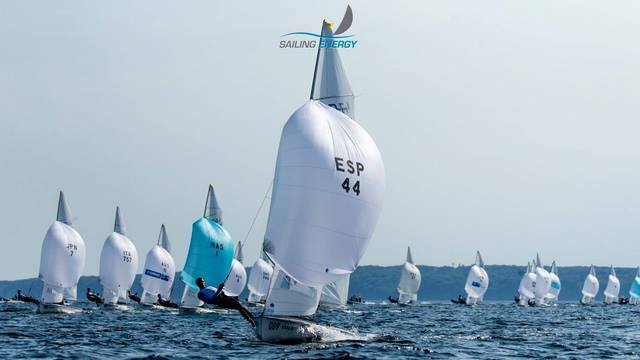 Max Salminen has taken an eight point lead in Aarhus after winning this incredible race, while Josh Junior and Zsombor Berecz are tied on points in second and third. That's some dedicated sailing right there!